Welcome to the monthly bulletin from the Town of Bow. As part of our commitment to keep citizens informed and involved in the community, we hope you find this information to be useful. Follow the public meeting schedule. Sign up for text and email notifications through NotifyMe®. Follow Bow Police, Recreation, and Library on social media. The Town’s budget books have been distributed to the Budget Committee. The first budget review meeting will be held on January 9, 2018, 5:30 p.m., in Meeting Room B of the Municipal Building. The Town recently received a $2,134 rebate for the installation of the new energy efficient Heat/AC units at the Old Town Hall. At the end of the year, Bow Fire Chief Mitchell Harrington presented the following awards at the Fire Department’s annual dinner. The start of every new year is a time of grateful reflection and hopeful beginnings. In the spirit of grateful reflection, the Baker Free Library Trustees wish to thank the generous donors who helped the library Foundation exceed their fundraising goal. Just as the library originally was built brick by brick, the library Foundation is building long-term support dollar by dollar and the Trustees thank every donor for every small and large donation. In particular, the Trustees would like to thank the generosity of Bogside Publishing for donating a match of $500 for the first $500 raised on Giving Tuesday, a donation that helped launch the final month of fundraising. The Baker Free Library Foundation actively raises donations to help fund a long-term endowment to support the Baker Free Library and last month, because of your donations, the Foundation exceeded their goal of raising $10,000 for the endowment fund. In the spirit of hopeful beginnings, may we challenge you to come see what those donations have created at the library. If you do not yet have your library card, we encourage you to start a new relationship with the library by getting your card in 2019. If you already have your library card, we encourage you to come in and use the resources available to you. We hope that in 2019, every Bow resident will join us regularly at the Baker Free Library and that each of you will have a happy new year. Always looking to see what is going on in Bow? All Bow Calendars in one place - Burbio! 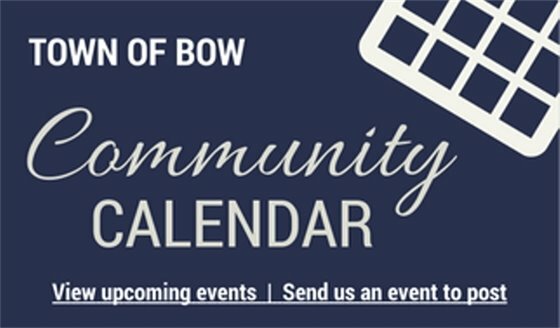 Given the posts we've seen on the Bow NH Community Facebook page the past few weeks, and the long-held desire to have a community calendar that shows all of the events around town, the Library has partnered with Burbio.com to offer ALL Bow calendars through one service, where you can choose which calendars are included in yours! And what do we mean by "All Bow Calendars"? We mean all school calendars in the district (Dunbarton Elementary too), the SAU 67 calendar, the Town public meeting calendar, Town community calendar (where other town groups post their meetings/events), the Parks & Recreation calendar, the Library events and meeting room reservation calendar, and the BHS athletics calendar for seasonal sports (broken down by sport). The best part is you choose which calendars that you want to follow! It's easy to use: go to Burbio.com and type in 03304 for our zip code. All of the calendars for Bow will pop up, and you then create an account and choose which calendars to follow. You can receive a weekly digest update by email every Sunday, as well as other emails during the week, or no emails during the week. Also, Burbio has an app - so you can take this calendar with you on your cell phone. If you have Alexa, you can sync your account to ask Alexa about Bow events. And last, if you have a personal Google calendar, you can add any of the Bow calendars to it for your convenience. The best part about this whole thing is that the service was FREE for us to set up, and is FREE for you to use. So no more wondering which board is meeting is where on what night about the budget, or whether your kids have conflicting events at two different schools - you'll be able to see everything at once on all of the calendars you follow. Please let us know what you think about it, and pass the information on to your friends and neighbors. We're all better off when we know what is happening in Bow! Questions, email Lori Fisher, Library Director, at lori@bakerfreelib.org. FREE community yoga classes on January 20, 2019. Due to a collaboration with Yoga NH, the library is pleased to offer free 11-hour yoga classes each month to Bow residents and library card holders! These classes are suitable for all levels, the next class for January will be held from 9:00 a.m. to 10:00 a.m. on Sunday January 20, 2019. New starting in 2019 – non-Bow residents can attend for a fee of $12.00 per class. Pre-registration and payment is required through http://yoganh.com. We cannot accommodate drop-ins for non-Bow residents, so registration and payment is required prior to the class through the web site. Bow peeps can now have their non-Bow yoga friends take class with them! Classes are held in the Library's Merrimack County Savings Bank Room in the Lower Level. Because these classes are being held outside of library operating hours, participants will need to enter through the Lower Level door near the handicapped parking and ramp. Bow residents, please register in advance by contacting Lori Fisher at 224-7113 or lori@bakerfreelib.org. Thank you to Yoga NH for giving back to the Bow community as part of their paid use of our facilities for events and workshops! If this is your first time attending our community classes, please arrive by 8:45 a.m. so that you have time to fill out the liability waiver and get set up. Namaste! The Concord and Bow librarians prevailed again at the 2nd trivia night, and now we're mixing it up by having Concord, Bow, and Hooksett librarians make up the team of 6 to beat! Come try your hand at prevailing over this amazing team (don't worry - the prizes go to either the top public team, or the 2nd place public team if the librarians win again). So it's worth a try! Questions? Call Lori at 224-7113 or email lori@bakerfreelib.org. The Friends of the Baker Free Library will hold their next donation day on Saturday January 26, 2019, 10:00 a.m. to 2:00 p.m. Questions? Email info@bakerfreelib.org. The Library will be closed on Monday January 21, 2019, for Martin Luther King, Jr. Day. January, February, and March Happenings! Join us for a FUN after school activity with Instructor Joe Rider on TUESDAYS January 22, and 29. Gear up and begin with warm ups that will emphasize skating skills, stickhandling and shooting. Then it will open up to play hockey. Yoga to balance the mind and body. Yoga postures will be integrated with energy balancing techniques, breathing exercises and mind-body awareness. By the end of the session, participants will have a variety of techniques that they can incorporate into their daily lives to find a greater sense of balance and alleviate stress. Wear comfortable clothing and bring a yoga mat. Open Gym Ages 3-5 from 9:00 a.m. to 9:45 p.m.
Come have fun in the gym! Each week we will have fun gym activities planned to keep kids moving during this winter season. Grades 1-4 10:00 a.m. -11:00 a.m. No matter what your skill level come join our floor hockey program. We will work on stickhandling skills, shooting, passing, and play mini games. Older groups play games. Sign up now! It’s so much fun! It’s Skating & Sledding Season! Parks & Recreation Director Cindy Rose will be attending the Northern New England Parks and Recreation Conference in January. This conference consists of three days of educational classes, speakers and exhibits. Hampshire roads. Failure to comply with this law is punishable under NH RSA 265:79-b (Negligent Driving) and subject to a penalty fine of $250.00-$500.00 for a first offense with increased penalties for subsequent offenses up to and including loss of license. The Town and School Elections will be held on Tuesday, March 12, 2019, at the Bow Memorial School. Polls will remain open from 7:00 a.m. to 7:00 p.m. Candidates filing on the last day of the filing period are required to do so in person at the Office of the Town Clerk. The deadline for registering to vote is Friday, March 1, 2019, during normal business hours, 7:30 a.m. to 4:00 p.m., Monday through Friday, at the office of the Town Clerk /Tax Collector. Voter registrations will be taken at the meeting of the Supervisors of the Checklist, which will be held between 11:00 a.m. to 11:30 a.m. on Saturday, March 2, 2019, at Bow Municipal Building, 10 Grandview Road, in Meeting Room B.
Absentee ballot request forms are posted on the Town website. Check out the elections page for information about upcoming elections. The Town Clerk's Office has the new dog tags for 2019. You can register your dogs anytime between January 1, 2019 and April 30 , 2019, to avoid late fees. Dogs may be registered online, in person or by mail. Please remember that in order to register your dog, your dog's rabies vaccine must be current. View past issues of the Bulletin.